Rose and Amy had a joint birthday party with some family and a few friends from school. Here are some photos from the day. It was a blast! Decadent Desserts! 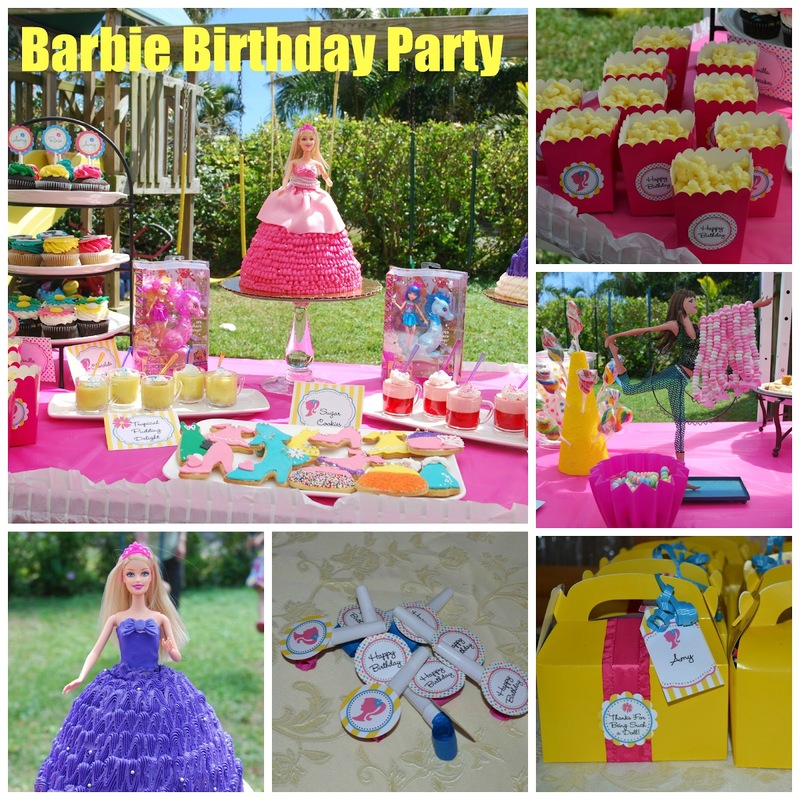 Cupcakes, Barbie doll cakes, popcorn twists, tropical pudding delight, sugar-free strawberry Jello-O parfaits, cookies, oreo cakesters and part of the candy buffet is shown. 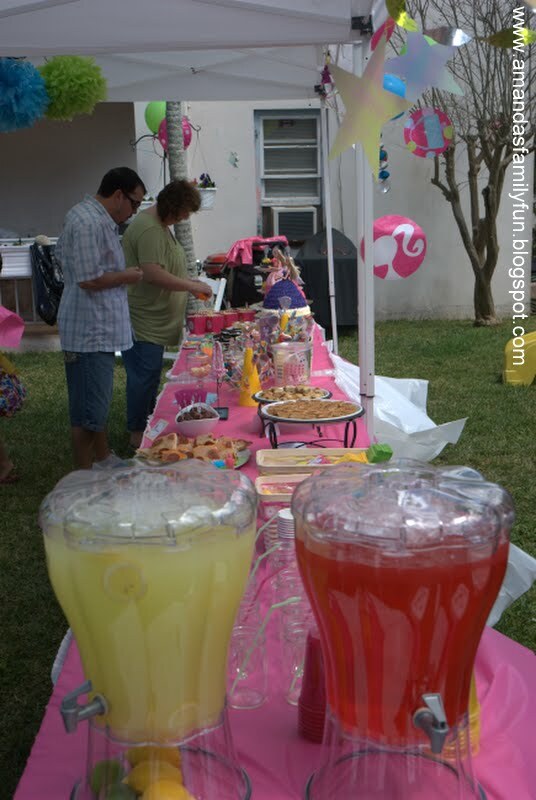 I did not put any candy in the treat boxes, I let each guest choose their own from the candy buffet and fill up a little bag of sweets to take home. Favour boxes -- very easy to make. Hot glue on the ribbon and thank you tag (my Aunt did this for me while I was doing a lot of paper punching and cutting!). I filled them with some Barbie & princess trinkets and then I tied on the little name tags. 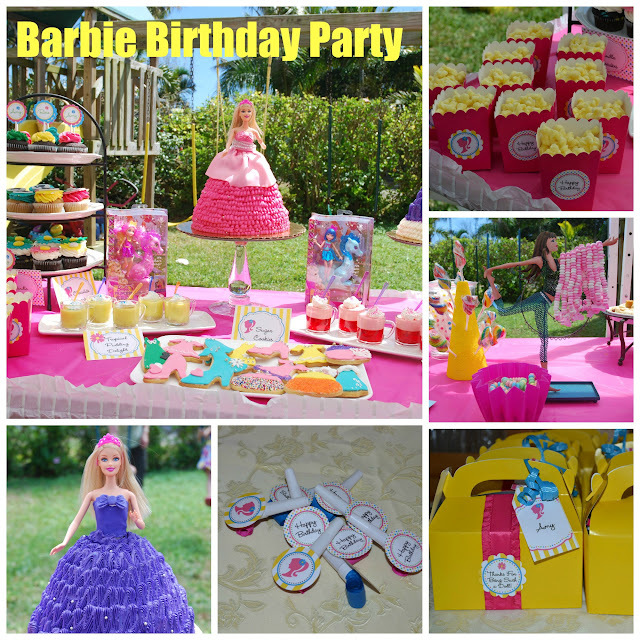 The theme was Barbie in Princess Charm School. We practiced balancing books on our heads like in the movie and then had a race, we made tiaras, and had some princess themed candy and favours in the favour boxes. We also played the girls' favourite party games -- pass the parcel and freeze dance. Somehow, I managed to not have any photos of the regular food! We had pizza, mini quiche, mini sausage rolls, meatballs etc. Several items were whey free to accommodate a guest with food allergies and I put a little smiley face on the back of those food labels. Unfortunately, I burned the special pizza for that guest, but there was still enough extras for her to eat. There were many other printed accessories from my party pritnables kit but I didn't have good photos of all of them somehow. It was a busy day!! After a huge morning shower which had me worried, it turned out to be a sunny afternoon and loads of fun for the kids. It was lots of work and I'll probably scale down a bit next year -- but I have been told I say that EVERY year! WOW! What a celebration! Thanks for linking up!